Where are you, world? Where are you? In order to mark the Day of Remembrance for all Victims of Chemical Warfare, we’ve put down some thoughts along with a book review. As we speak this, the civil war in Syria rages on with no end in sight. Chemical weapons have been used to crackdown on the protesters – and even as the world listens to political rhetoric deny the claim, survivors have come forth to speak out with their narratives. Jean Sasson’s Love in a Torn Land, Joanna of Kurdistan: The True Story of a Freedom Fighter's Escape from Iraqi Vengeance, tells the true story of Joanna Al Askari, a Kurdish lady who survived the Chemical Weapons attack in the 1987-1988 Iran-Iraq war. 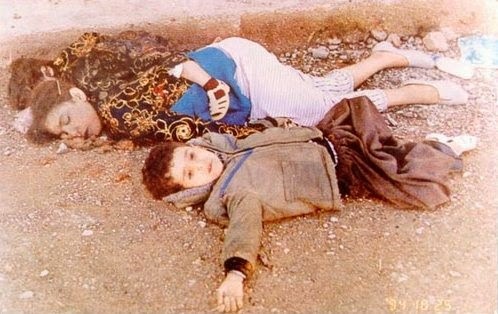 Victims of Halabja poison gas attack in 1988. With everything from a childhood as a Kurd in Baghdad, to being a Kurdish freedom fighter in the Iran-Iraq War, Joanna and her husband Sarbast’s story takes one through the travails of life under a brutally dictatorial regime. In the political game that the armed conflict between Iran and Iraq was, a genocide of the Kurdish people of Iraq unfolded with almost frugal international attention until it was too late. In the midst of the myriad challenges, Joanna survived the attack with chemical weapons on her village, Bergalou – launched at the behest of Saddam Hussein, and executed by his cousin, Chemical Ali, in 1987. She woke up to the painful sight of birds dropping dead out of the cerulean skies below, the dull thud of their light and limp bodies against a stunning silence was a grim notification of the evil that was to come. Chemical Ali, who was known for his ruthlessness, had ordered the indiscriminate use of chemical weapons. Everything from mustard gas to sarin, tabun and VX were used against the Kurdish people in a genocidal campaign. The attacks occurred from April 1987, and spilled over into 1988. By the end of it all, over 4,000 villages were destroyed, and 180,000 Kurds had been killed, with 1.5 million being deported. He was known as Chemical Ali for his ruthless campaign using Chemical Weapons. Joanna was temporarily blinded in the attack, making escape tougher. After another bombardment and lying in the rubble waiting for death, the couple fled over the mountains and escaped the harsh life they were forced to live, because of their ethnicity. Chemical Weapons are classified as weapons of mass destruction, and can be widely dispersed in many forms. 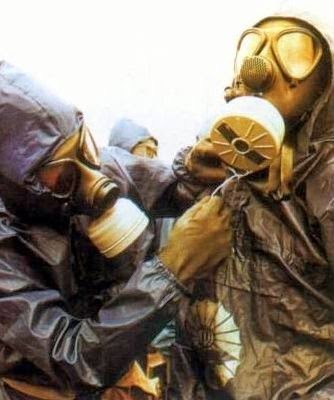 The Chemical Weapons Convention of 1993 imposes a worldwide ban on the production, stockpiling and use of chemical weapons, but this has barely been adhered to. Chemical weapons have been used in Syria, as testimonies reveal (here, here and here), and this is a dangerous trend in a country that seems to be embroiled in a state of conflict without resolution in sight. To know more about chemical weapons and the impact they have, click here. To read the Chemical Weapons Convention, 1993, click here. To buy yourself a copy of Love in a Torn Land, click here. To know more about Joanna’s story, read an interview by Jean Sasson here.